Foundry Architects and Brian Levy have designed a modern new alternative for would be down-sizers. Minim House, which is located at Washington DC's Boneyard Studios, is a modest cypress-clad rectangular structure that shelters a sweet space-saving and livable 210 sqft interior, with off grid versatility. Click through the images to discover the meticulously designed features of this award-winning Tiny House 2.0. The Minim House’s green credentials include walls made from highly insulated prefabricated SIPs, a 960 watt solar array, a 290 gallon rainwater treatment system, and all LED lighting. Inside two people can live and work comfortably. There is a 10′ galley kitchen, a 8.5′ couch, 5′ closet, office space, bed, bathroom, large windows, a flexible dining table/bar/coffee table, a full audiovisual system and even a 5′ desk that opens up to reveal a full sized keyboard. The openness of the interior gives it a light and dynamic feel. Brian Levy spent his teenage years living in a relatively large family home with an accompanying long list of chores, high running costs and large number of possessions. During a trip to visit his sister, who was at that time working on an organic farm, he was impressed by the intimacy and efficiency of her small trailer living quarters. Brian’s Minim House updates the aesthetics and liveability of Tiny Homes such as those popularized by the Tumbleweed tiny house brand. Within its context at Boneyard Studios, it’s also an attempt to promote a lifestyle that offers the possibility for ordinary people not to be tied down by huge amounts of debt, maintenance or the responsibility of managing larger homes. The idea is simply that living with less makes life easier. There are challenges to be overcome in Washington. D.C.’s zoning laws, which state that single residential dwellings are only permitted on alley lots of 30 feet or wider. Only a handful of such lots currently qualify. More broadly, the Boneyard Studios founders hope to change opinions about what affordable housing can be. While there are thousands of mobile housing communities across the USA providing low cost housing, they are not generally considered beautiful places. By providing a showcase of attractive affordable housing, Boneyard Studios hopes to expand the places where such micro home communities are welcome. 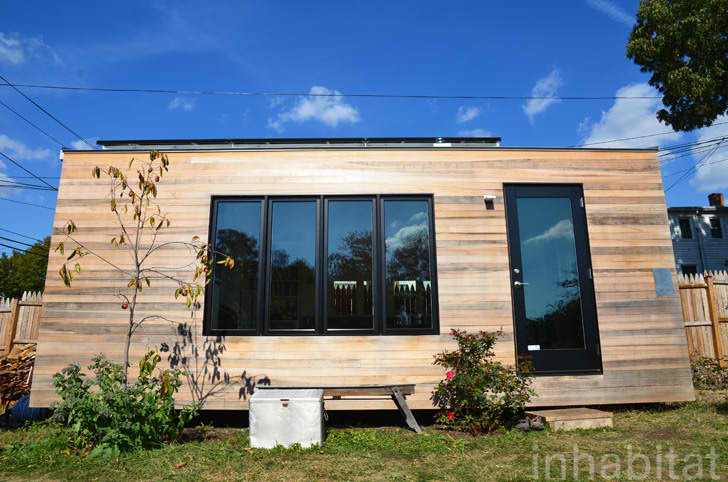 Boneyard Studios hosts open house events, demonstrating the livability, simplicity and beauty of micro homes with the intent that attitudes and regulations can be changed to allow more of them, everywhere. Anyhow....this is the way I would personally choose to live, if I could get a City Counsel in upper NYS to allow such. Townships are "considerate of one thing, and one think only" - Tax income. If it doesn't generate money for a township...it doesn't pass a rezoning scenario. I don\\\'t want to live in a trailer part scenario...no offense (my choice)...but a beautiful little developement of 10-15 of such dwellings would be fantastic. Btw, I am so curious if the owner has managed to stay warm with the heater?? We have read such mixed reviews about it and were afraid of being cold in our own 221sq footer that we bought a much larger heater. We live in southern Oregon. So how much would this cost? Love this layout...for once a small footprint that doesn\'t require climbing a ladder to get into bed! Only other wish is for a bigger bathroom space that includes a tub/shower combo. Then it would be the perfect retire pad. It is the wave of the present and the future. Building laws need to be changed across the nation. The only bad thing is that the windows should be made of non reflecting glass. Birds will attempt to fly through the house ( not seeing the clear glass)and smash themselves to death on the windows. Love it! What a beautiful idea for a retreat or a cabin somewhere too! A 10 foot wide galley affords room for two cooks in the kitchen. It’s designed to accommodate a 7.1 cubic foot refrigerator under the counter and kitchen wall space can accommodate mason jar racks with 50+ quart jars. Minim House is clad in untreated, shiplapped cypress, with mitred corners, and will age to a light grey. The cypreseen in cypress is a natural preservative. Frank Lloyd Wright’s Pope-Leighey house in VA used a similar technique in the 1940s and is still intact. An in-counter, high Btu marine grade cooktop saves space by hiding under a cutting board. A foot pedal operates the faucet for better sanitation and water conservation. The bathroom comprises a wet room arrangement, with showerhead over the sink area, all enclosed in stainless steel. The Incinolet incinerator toilet is tucked in and screened off with a shower curtain when the water is on. A tankless water heater is positioned above the toilet. The 8.5′ couch opens up to reveal storage, a 40 gal water tank, and water filter. An onboard 3 stage Doulton filter system makes collected rainwater water usable for showers and dish washing. The full size bed hides under the office area platform, and slides out from underneath. Two locking casters secure it. When extended, there is space to walk around it on three sides. A Walnut work surface has several uses, shown here as a dining table. Up to 6 can be seated for dinner. A 5-in-1 Cubista ottoman from Resource Furniture adds up to 5 seats in front of the window or around the dining table, and compacts down to one cube when not in use. The large window array next to the door is sized in 9:16 proportion, a projector screen hanging above it doubles as a solar shade. A small LED projector affixed near the bookcase displays a 90” image, accompanied by speakers on either side of the window. A Dickenson marine propane heater appears to the left of the screen. The 5′x7′ office and storage area sits on top of the bed platform, and allows space for a full size keyboard, a generously wide desk, and a through-the-wall a/c unit built into the cabinets. There is also a 5′ full width closet. Within it's context at Boneyard Studios, Minim House is also an attempt to promote a lifestyle that offers the possibility for ordinary people not to be tied down by huge amounts of debt, maintenance or the responsibility of managing larger homes. 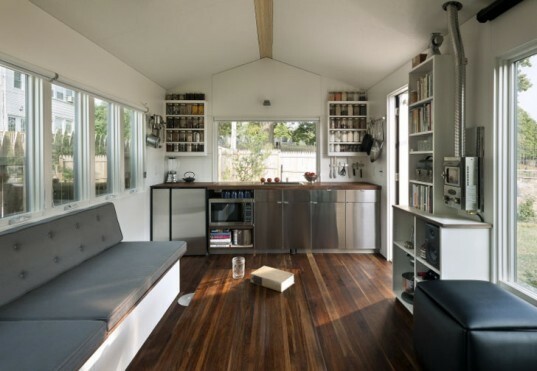 The largest of the tiny homes at Boneyard Studios, Minim House has already received great accolades from the AIA.